Thai Food Friday. One of my and Martin’s favorite food traditions. We try to cook at home as often as we can, but sometimes, after a long week, you just want to unwind and let someone else bring you some hot, delicious, ready-to-eat food. We used to live less than a block away from Thai Boom, a little hole-in-the-wall mom & pop restaurant located right on the busy Venice Boulevard thoroughfare, and luckily, our new place is still within the delivery radius. Thanks to its impressively extensive menu featuring typical Thai dishes (pad thai, pad see ew, rad na, and the like), more traditional Thai dishes (tod mun and fish maw soup, anyone? 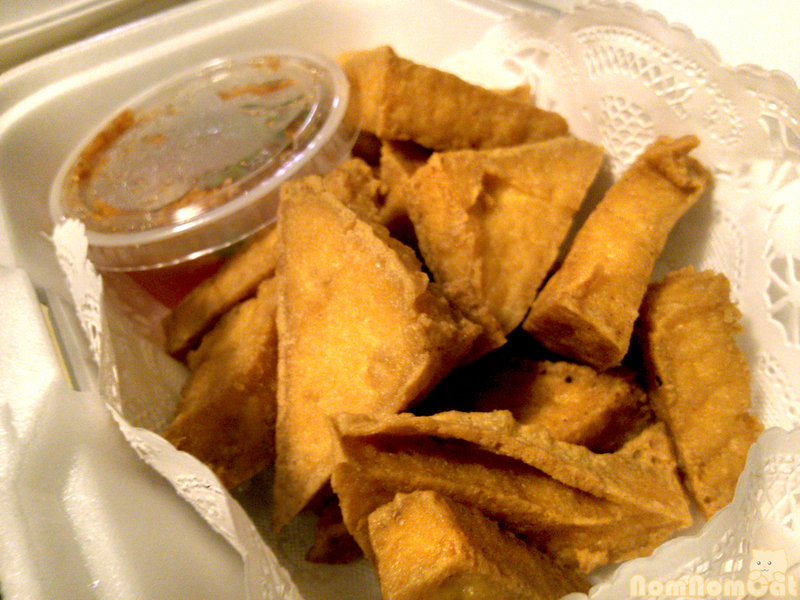 ), and even pan-Asian cuisine such as Vietnamese hainan chicken, Chinese roasted char siu pork, and Japanese gyoza, we frequent Thai Boom so often that all three delivery guys recognize us and we are on first-name basis with the cashiers who take our phone-in orders. We’ll occasionally eat at the restaurant as well, hence the varied backgrounds and lighting for the photos below. Martin and I are admittedly creatures of habit; when we find something we like on a menu, we’ll keep ordering it until we get sick of it (if that time ever comes). 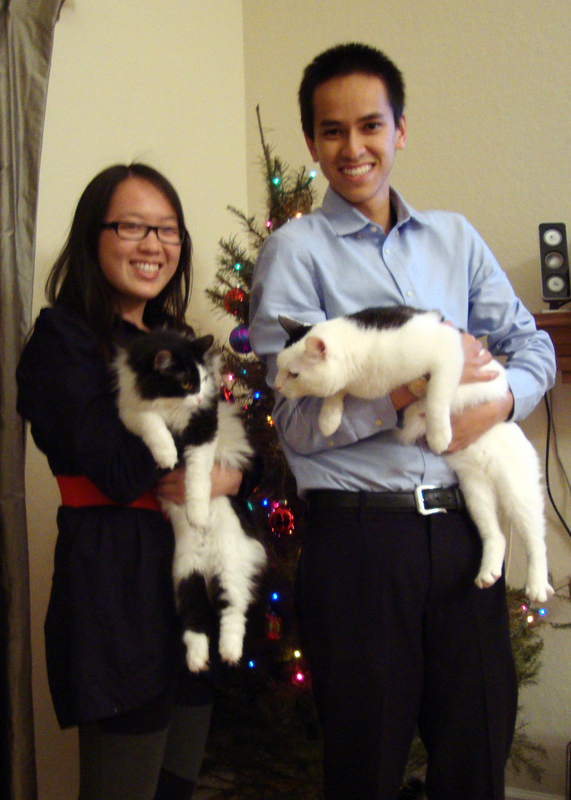 But even so, over the past three years, we have been able to sample a great variety of dishes. 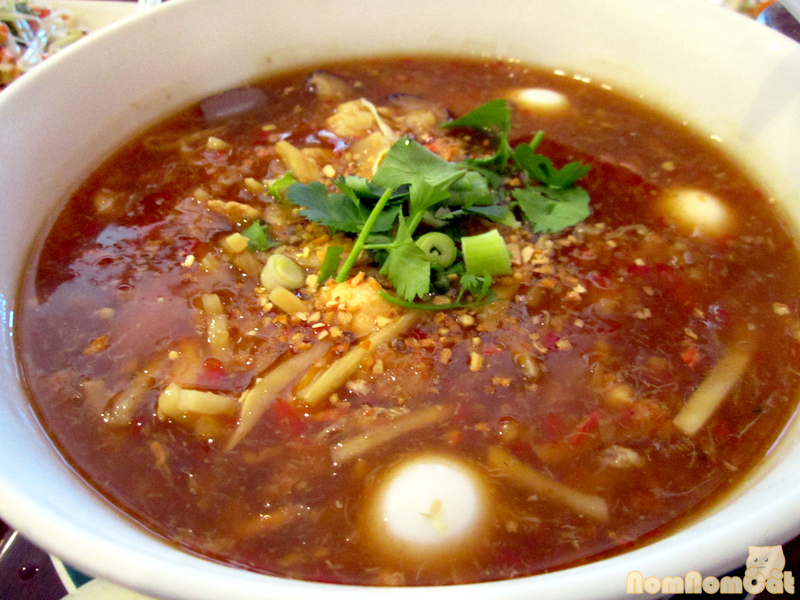 Arguably the most daring is the kra por pla — a thick soup filled with fish maw, crab meat, hard boiled quail eggs, congealed pork blood, and bamboo. Fish maw, a euphemism for the swim bladder, is the offal of the sea. With a soft and airy yet chewy texture, the essentially flavorless collagen takes on the bold flavors of the spicy broth. Another “unusual” ingredient is the congealed pork blood, known as huyết in Vietnamese cuisine, basically a steamed blood cake that resembles tofu or pudding in texture. Altogether perfect for a cold night, but not for the faint of heart. Another starter we’ll order on occasion is the fried tofu. Super crispy, golden triangles that are silky smooth on the inside, dipped in a homemade sweet and sour sauce, these are a great splurge – worth every calorie. 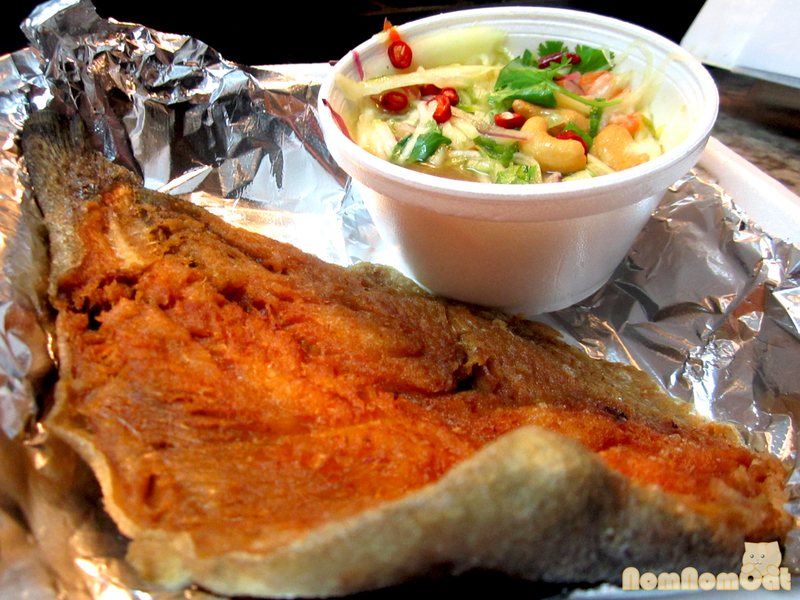 On other visits, we have also ordered the tod mun (fish cake patties) and som tum (papaya salad). The tod mun are crispy and fragrant with lemongrass and kaffir lime leaves. The som tum can be ordered extra spicy (“Thai spicy”) and arrives with finely julienned green papaya swimming in a fish sauce, chili, and dried shrimp dressing. Two traditional Thai favorites! I love Thai soups. The trifecta of galangal (similar to ginger in appearance but with a much more potent flavor), kaffir lime leaves, and lemongrass impart their aroma to create a broth unlike any other. 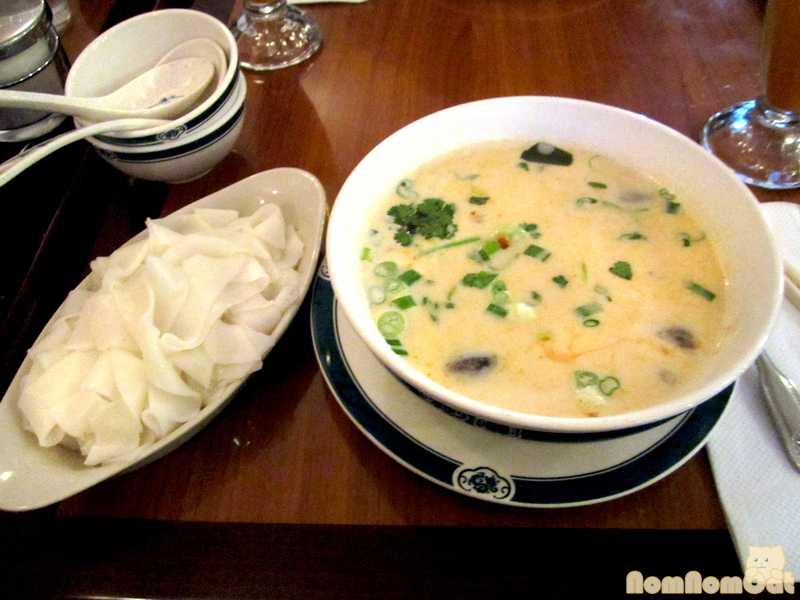 Tom yum is a clear broth soup while tom kha gets its opaque creaminess from coconut milk. I make a Vietnamese spin on tom yum (actually tom khlong, which is tamarind-based instead of lime) at home so I like to order tom kha when dining out. 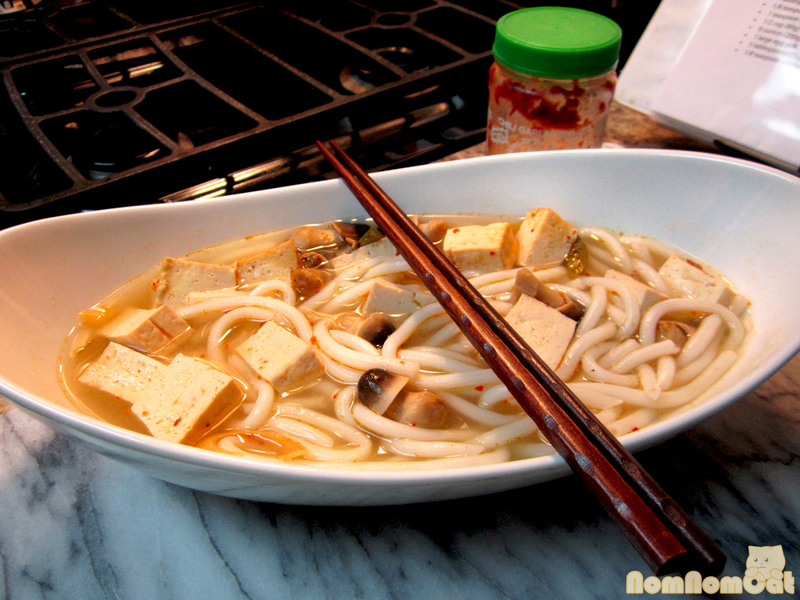 Thin slices of chicken breast or cubes of fresh tofu serve as the proteins, and I order my soup with a side of flat rice noodles (the ones used for pad see ew) to add a carb element. This is my go-to dish here! When we dine at the restaurant, the waitresses are always quick to bring us (well, me) this cute basket featuring pepper in many preparations. 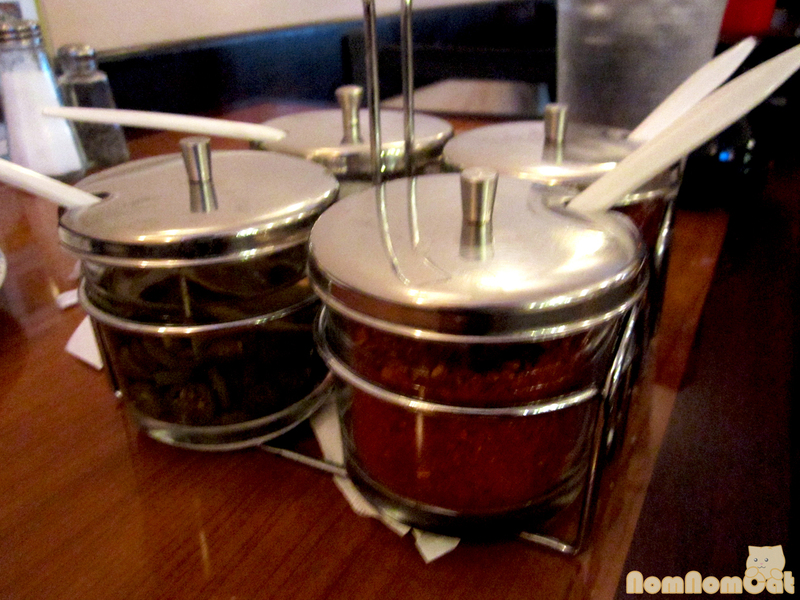 I always go straight to the sambal – a paste of ground Thai chilies, garlic, and vinegar. Speaking of flat rice noodles, Thai Boom of course sells one of the most popular dishes — pad see ew, flat rice noodles pan fried with Chinese broccoli (gai lan), egg, and a “brown sauce” (oyster sauce and soy sauce based). All of the noodle dishes including pad thai (which is generous with the fish sauce and not too sweet here) and rad na (basically pad see ew but with a more saucy “gravy”) come with your choice of protein: chicken, beef, pork, tofu (fried or steamed), shrimp, squid, seafood, or vegetables. 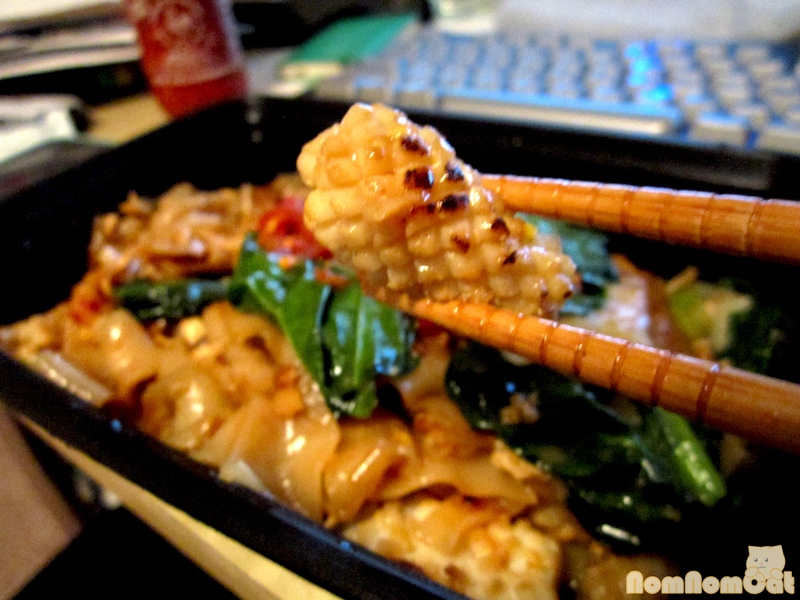 The sweet and savory noodles and crunchy greens are surprisingly not very greasy for having been pan fried. Martin’s favorite is the fried tofu; when you order it, they always ask if egg is OK as many tofu requests tend to come from vegetarians or vegans. I appreciate that extra bit of consideration. Martin’s all-time favorite dish from Thai Boom has to be the Hainam chicken, a Southeast Asian specialty that is essentially chicken and rice. The chicken is steeped to create a stock which is then used to cook the rice and to serve as soup to accompany the final product. 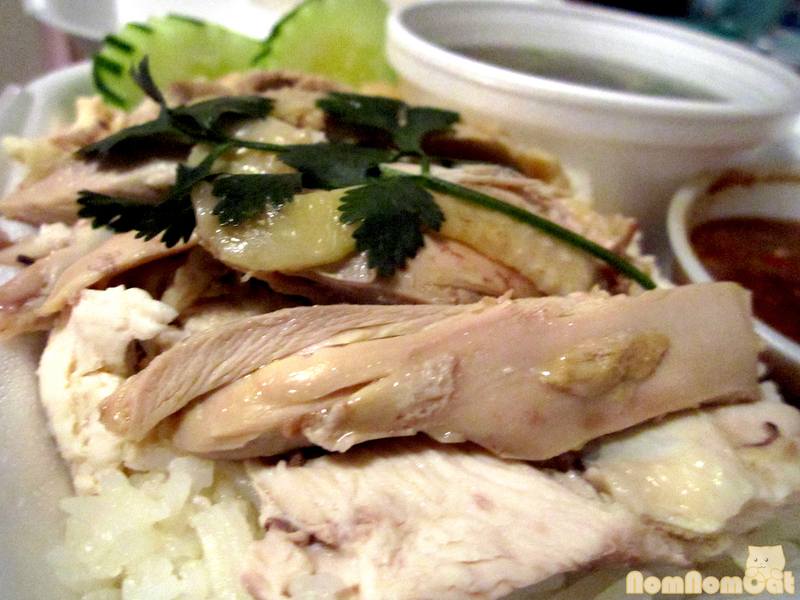 The chicken meat itself is shredded and piled on over the bed of rice. Sometimes simple is best. But the dipping sauce… oh the dipping sauce. This is what really makes Thai Boom’s hainanese chicken stand out from the rest. Packed with minced garlic, chilies, muddled lime, and I have no idea what else, this sauce adds a huge burst of flavor. 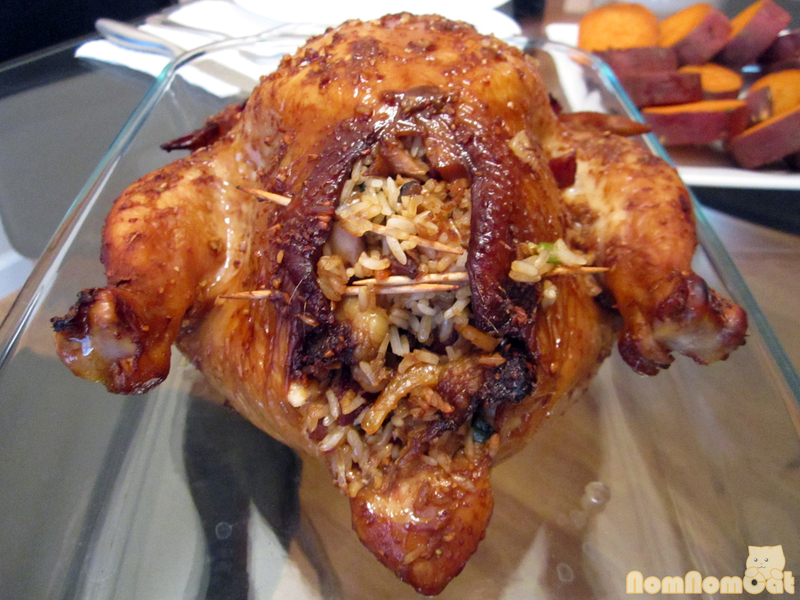 We would love to replicate it someday, but the layering of flavors is so complex that the task seems daunting. Once in a while, we dare each other to branch out and order something new. Last night, for example, I opted for the crispy fried fillet of trout, served with a mango salad. Oh. My. Fish. One bite into the crunchy, crumbly fillet and I was immediately transported back to my childhood. You see, at the Asian grocery stores that are very prevalent in Orange County (but sadly absent in West LA), you can pick out a live or fresh-frozen fish and have the crew clean it, gut it, and deep fry it for a few extra bucks. 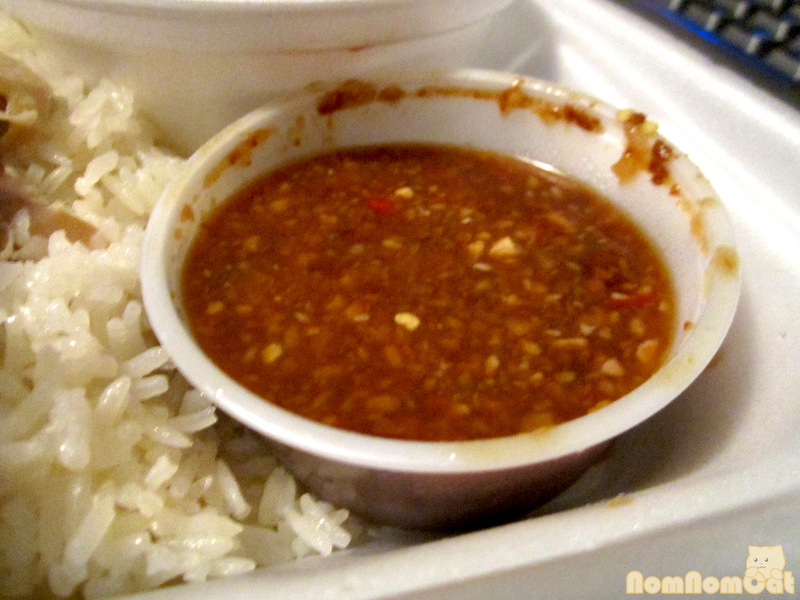 Bring it home, drizzle with nuoc cham, and serve with mounds of steaming hot jasmine rice – I was a happy camper. The edges were especially satisfying to crunch into, and what luck – they left the tail! (When I was a kid, my mom and I would take turns letting each other have that prized piece.) The mango salad was similar to the som tum with the substitution of tart green mango. 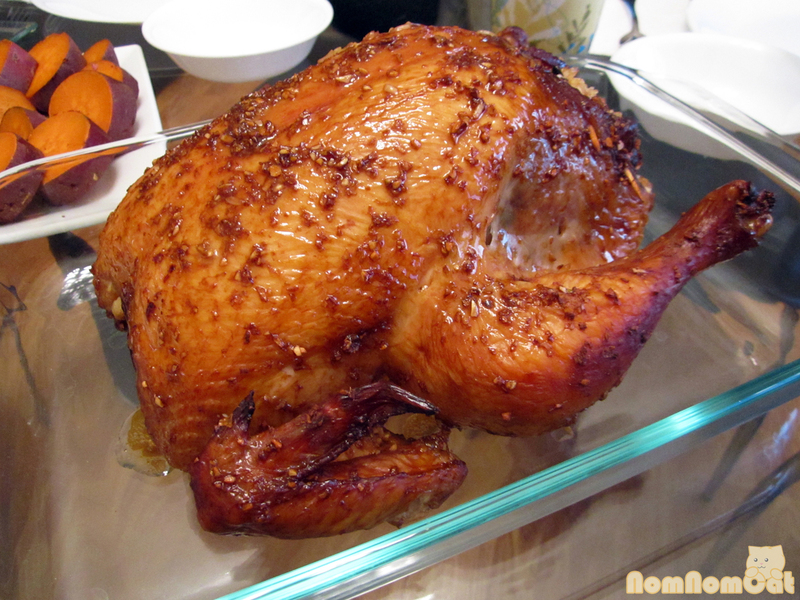 Marinated in fish sauce and chilies, this was a great punch of acid to cut through the grease of fried fish. If we’re lucky, Thai Boom would have tracked down some extra ripe champagne mangoes, the narrow bright yellow kind. When we eat in the restaurant, we can do a quick recon for them by glancing over at the counter where they are always on display, but when ordering by phone, have no fear! They are brutally honest about the quality of their mangoes; I remember once I asked if they had mangoes in season and the girl replied that yes, they did, but they are not particularly ripe so she would not recommend it. I’m still thankful for her saving me from the disappointment. But sometimes, luck is on our side and we get to finish our meal with one of these – a plate of coconut milk infused sticky rice, fresh slices of mango, and extra coconut milk for drizzling. And when the mangoes are just right, they are as sweet as candy. So good! So if you’re in the mood for Thai food, or if you are feeling too lazy to cook and happen to live within a few miles of Venice and Overland (in which case, howdy neighbor! 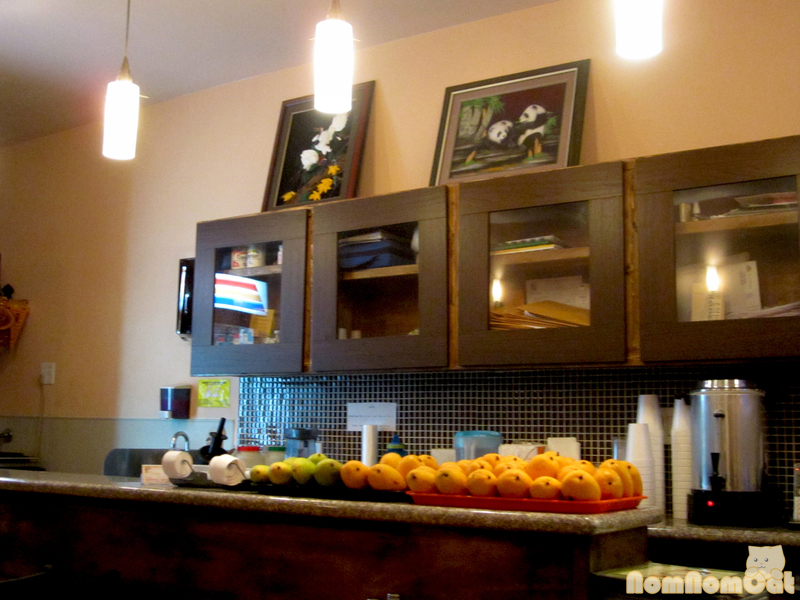 ), be sure to check out Thai Boom. There’s something for everyone! The other night I had a monster craving for some of my mom’s good ol’ chè bắp. Of all of the sticky rice and coconut milk desserts in the Vietnamese dessert repertoire, I think this corn rendition has to be my favorite. You can serve it cold, but nothing beats having a nice warm bowl of this sweet and satisfying dessert on a cool night. It requires a few relatively exotic ingredients, but they all keep very well so you can stock up for the rainy day when you just might crave a bowl of chè. 1. 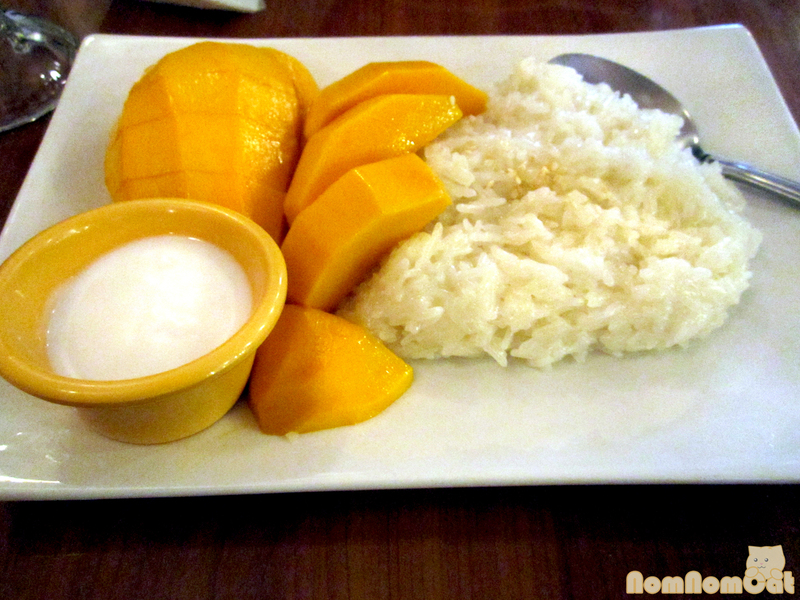 The Sticky rice (aka glutinous rice or gạo nếp): Ever had sticky rice and mango at your local Thai restaurant? That’s the kind we need. You cannot substitute long-grain jasmine rice or even the Japanese round variety used for sushi. It just won’t be the same (in fact, I don’t recommend even attempting to make chè with those types of rice!) Glutinous rice contains high amounts of a particular type of starch that gives it an incredibly sticky texture when cooked. 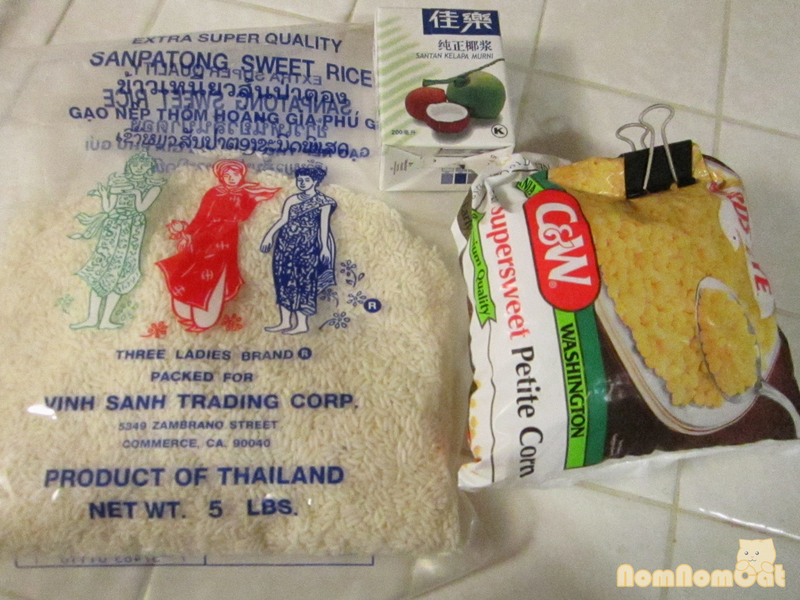 The bag I used (Three Ladies Brand) refers to it as gạo nếp thơm, fragrant sticky rice. You should be able to find manageable 5lb bags, unlike jasmine rice which is usually sold in massive 25lb sacks. Store unused rice the way you store flour or other grains – in an airtight container to prevent weevil infestations (not a pretty sight). 2. The Coconut Milk (nước dừa): One potentially confusing tidbit – nước dừa in Vietnamese can refer to both the creamy white coconut milk (again, think sticky rice and mango) and the clear, young coconut water (like ONE or Zico). In this case, we need the former, which conveniently comes in cans or cardboard tetrapaks and can be stored at room temperature in your pantry. Please note that I have not tried using the new coconut milk from Silk (the makers of soymilk and almond milk), but I have a feeling you won’t get the same flavor or consistency with it. Rinse the rice in cold water a few times. Add to a small saucepan and pour in the water. Sprinkle in a tiny pinch of salt. 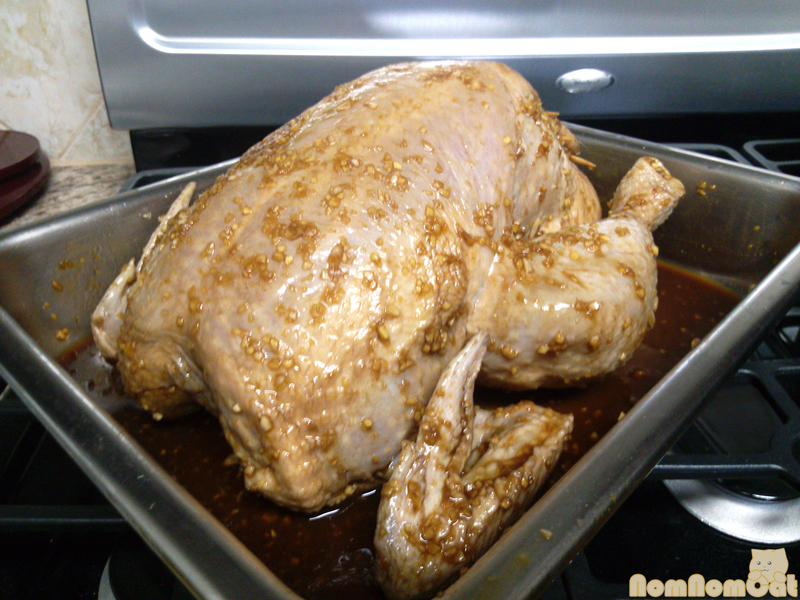 Bring to a boil and let it simmer uncovered for 5-6 minutes. Stir frequently to avoid burning. Bubble bubble, toil and.. sticky rice! 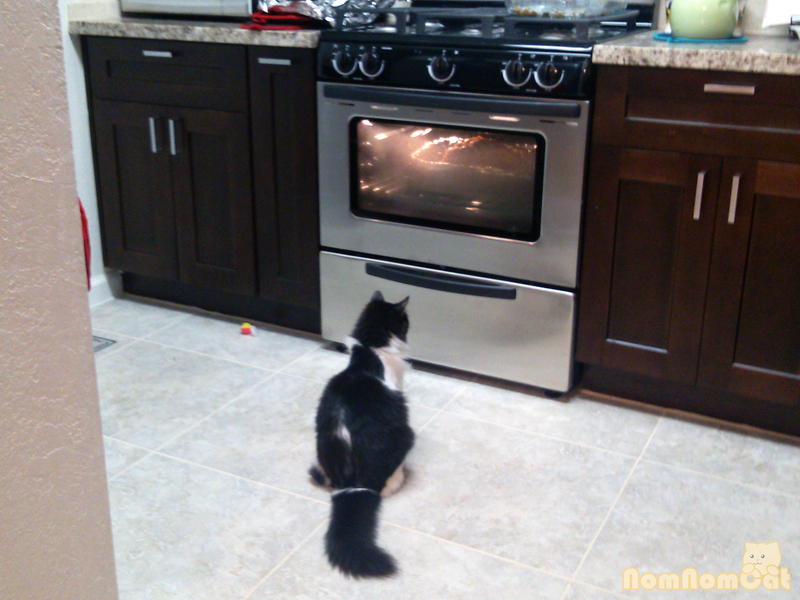 In the meantime, prepare your corn. 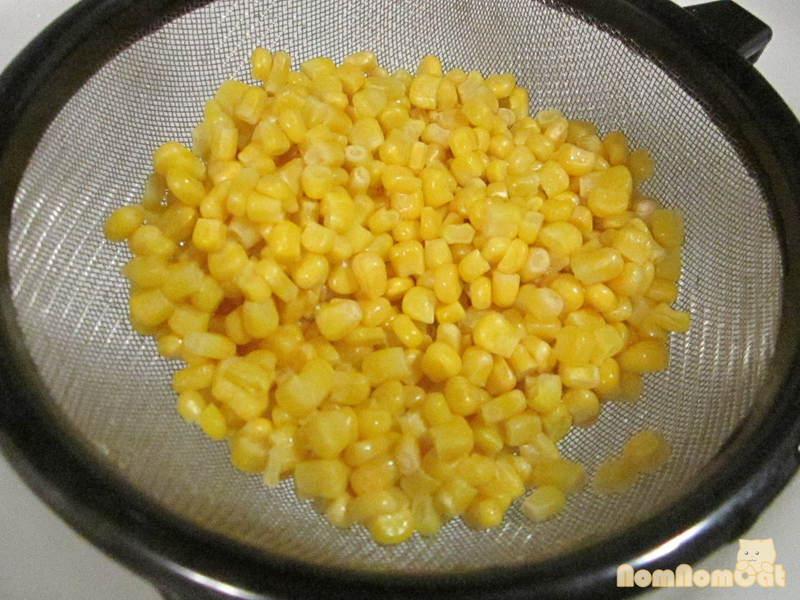 If using frozen corn like I did, you’ll want to rinse the kernels under cool water to let them thaw a bit. Fresh corn will need to be shaved off the cob, and canned corn will need to be opened and drained. At this point, you have a few options. You could leave the kernels whole like I did in the photo, or you can coarsely chop the kernels to break them up. You can also use the side of a large flat blade to flatten or squish the kernels. Your choice here will not really affect the taste of your final product, but it’s up to you how texturally congruous (or not) you like your desserts. Now that your rice is well on its way to becoming a delicious dessert, it’s time to add the coconut milk. 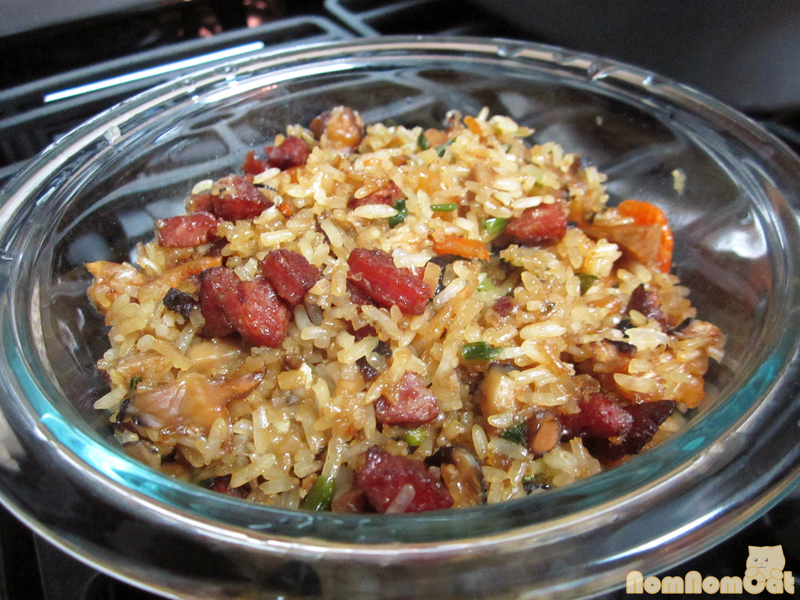 This step will impart fragrance and flavor during the final cooking stages of the rice. If you are using pandan (lá dứa), this is the time to add it. 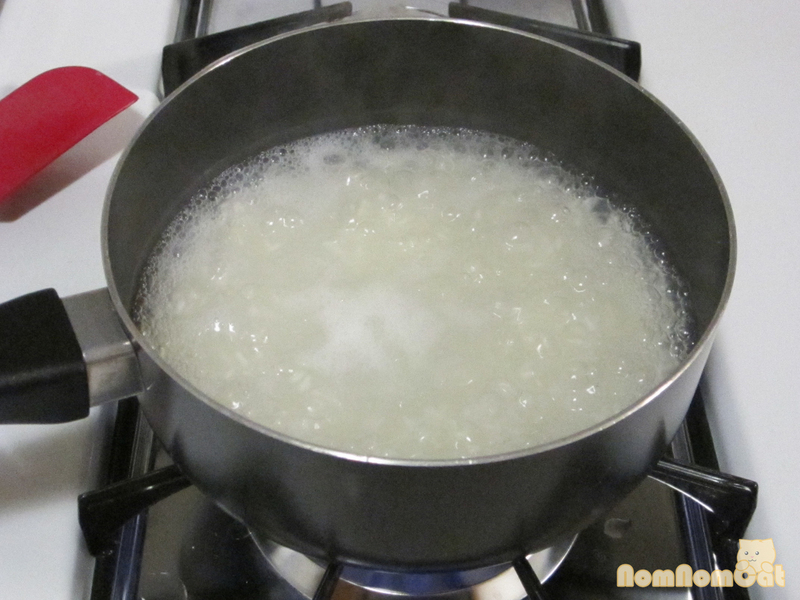 Cook for about 5 more minutes so that the rice absorbs the liquid. 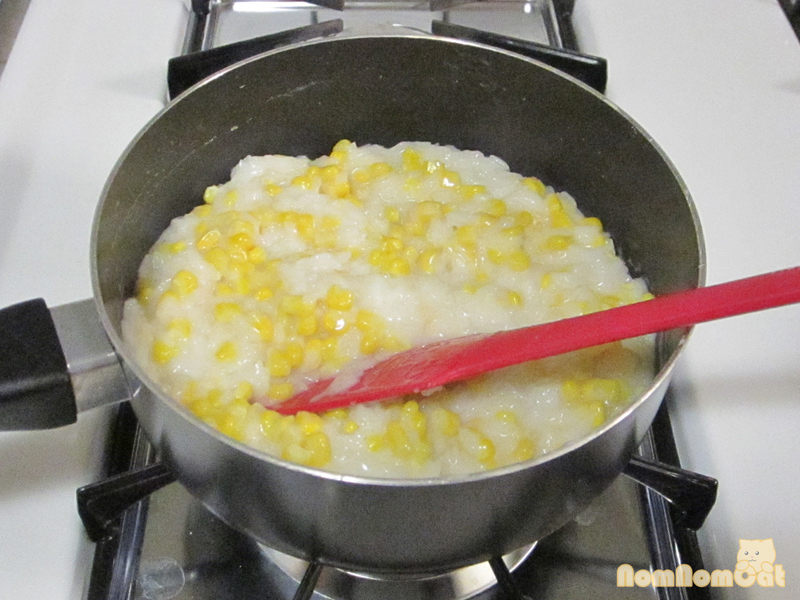 Stir in your corn and sugar. Continue cooking for a few more minutes (just 1-2 minutes if using frozen or canned, a little longer for fresh), adding coconut milk as needed to achieve the right consistency. 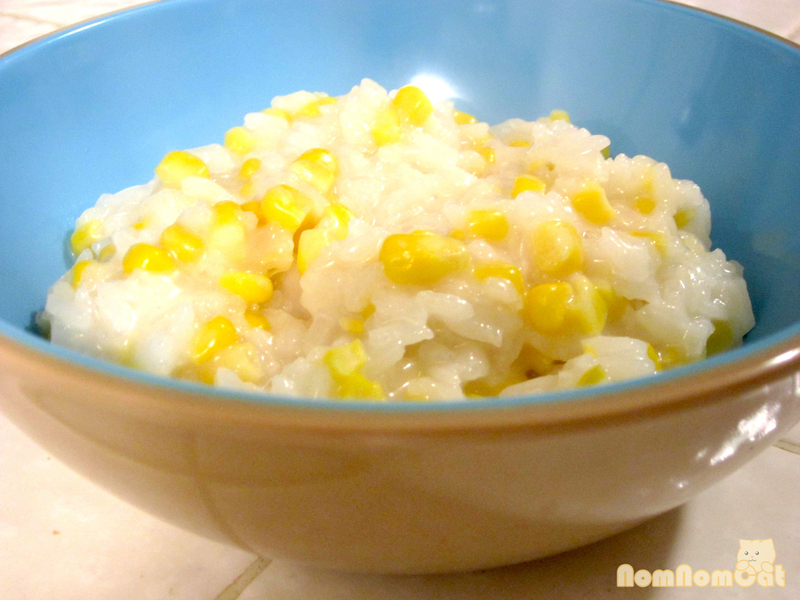 I love the contrast between the bright yellow corn and pearly white rice! Serve warm and refrigerate any leftovers (which you can then eat cold straight out of the fridge or warmed by microwave). This recipe serves 4. The aroma of the sticky rice and coconut milk boiling in the kitchen immediately makes me feel nostalgic and a teeny bit homesick. Memories aside, this is also just a darn good dessert and the warm, sticky texture always leaves me feeling full and satisfied! Many thanks to my mom for sharing her recipe.